When VMI introduced the Series 2006, it was not meant as a replacement for the Series 2001. Rather, these two models of horns were initially produced simultaneously and were almost identical. In 2001 VMI (Vogtländische Musikinstrumentenfabrik) announced developing a new B&S alto saxophone which finally was showing at Musikmesse Frankfurt 2002. The new alto reflects the tradition of 100 years of saxophone making in the Markneukirchen area. For the first time ever laser measurng tools were used to completely design the body of the instrument. The new measuring technique made it possible to optimize the tubing and provide a very even intonation scale with a dark, colorful sound and fast response. The new body is used for the series 2001 and 2006. 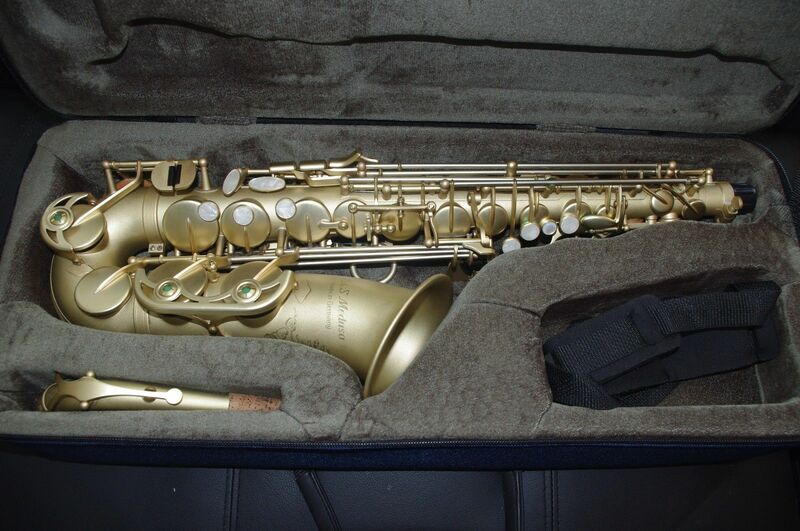 In addition to the standard 2001 series VMI also launched the 2006 Artist Line of alto-, tenor- and baritone saxophones based on their pro line series 2001. The instruments sport a hand made artificial [sic? likely supposed to be artistic] full body engraving. A finish combining the advantages of silver plating and VMI’s unique sand blasting ( FS/L) is optional. The model 2006 Medusa (pictured) features a unique engraving with the medusa’s head on the bell while the 2006 arist [sic] models show the traditional engraving. What exactly were the differences between the Series 2001 and 2006? 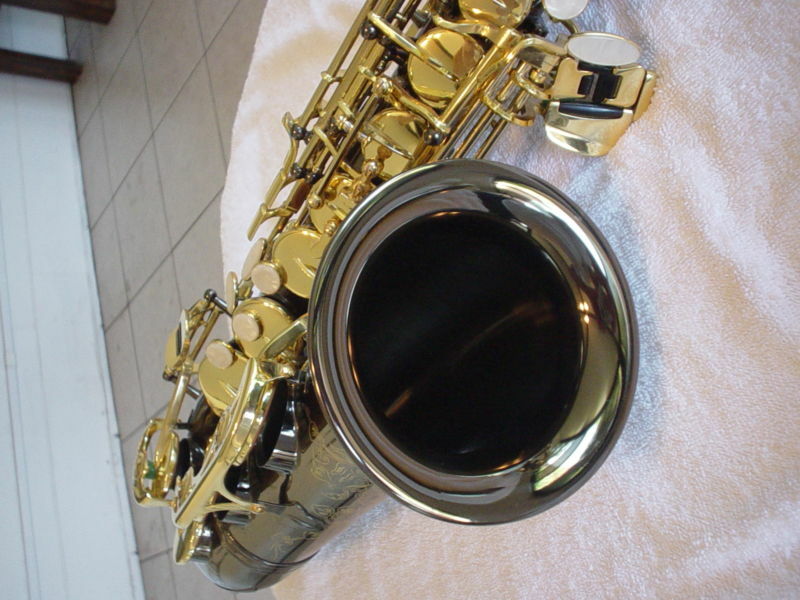 For the tenor sax, the body tube is the identical design to the Medusa. There are only a few minor differences in key design…Other then that, they are identical horns. Even in side by side play tests, they play the same. The 2001 is even more extensively engraved then the Medusa with the engraving going down through the bow and the inside of the bow curve (Medusa is available with deluxe engraving as an option). 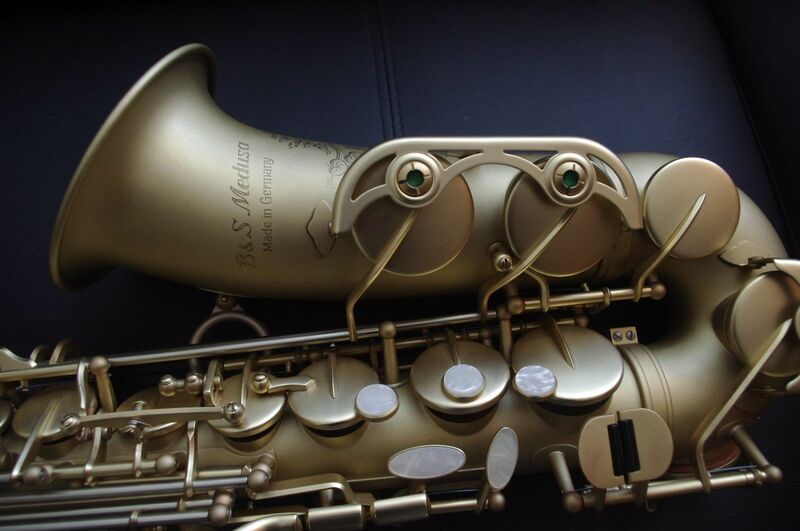 * Adjustable palm keys appear more on alto Medusa saxophones than tenors. Note: Given that I have been researching B&S saxophones for years, but to date have not stumbled across any Series 2006 Artist models, I am going to write the rest of this page using the terms Series 2006 and Medusa. Based on all my research, since the Artist model was a designation based on engraving only, all the information on this page applies to them as well. 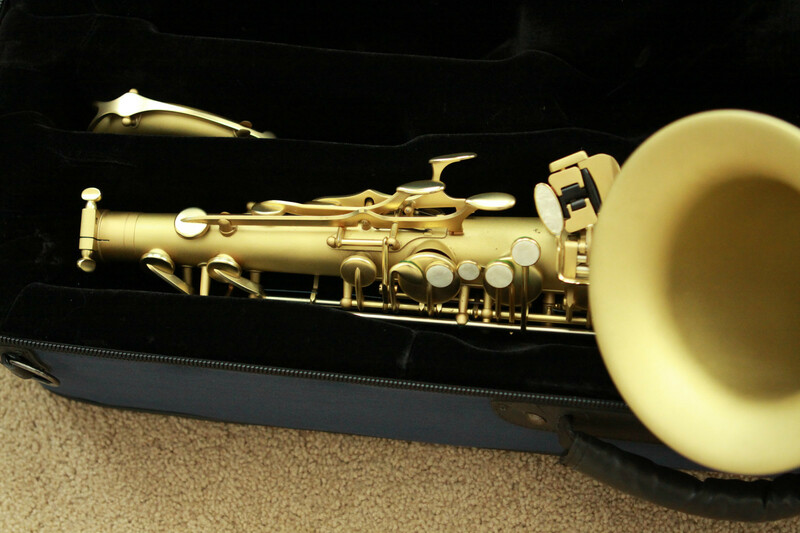 If you have an Artist model Series 2006 horn that you would care to share photos of, please contact me. Thank you. Kessler and Sons Music in Las Vegas, was an authorized dealer for B&S saxophones. Dave Kessler was kind enough to send me all the photos and materials he still had on the B&S horns (materials I have included in the corresponding pages on this site, and in the B&S galleries in Bassic Sax Pix). Beyond that, I also managed to dig through his family store’s website archives on the wayback machine. The latest development in the B&S Saxophone Line is the new series MEDUSA, reflecting a hundred of years of saxophone manufacturing. Developed by using latest laser measuring technologies and manufactured in the handcraft tradition, this instruments will set new standards for professional instruments. 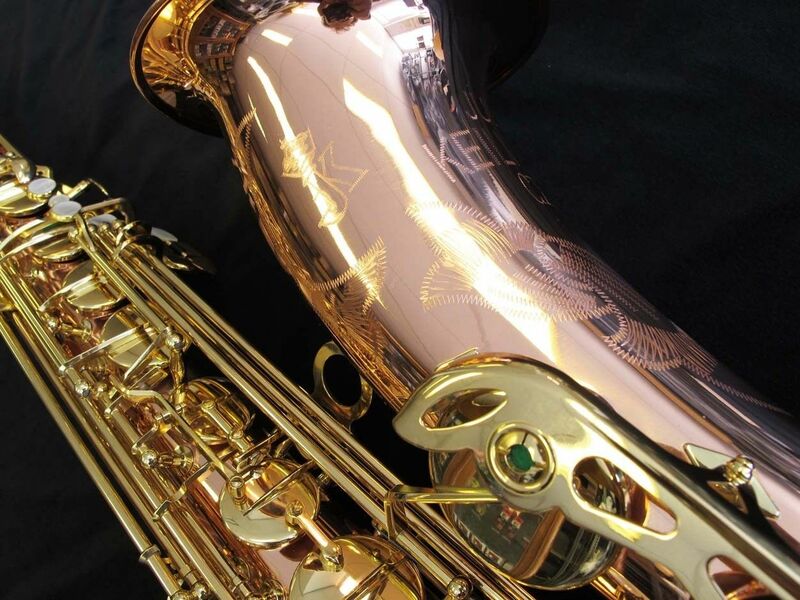 Beside, the for B&S saxophones common G# – bridge that allows the G# – key to operate smoothly without sticking , series Medusa will be equipped with an newly designed left-hand -cluster with C# -B – table key for more flexibility and smooth motion. Kessler & Sons Music proudly handles B&S saxophones including the new Medusa line. 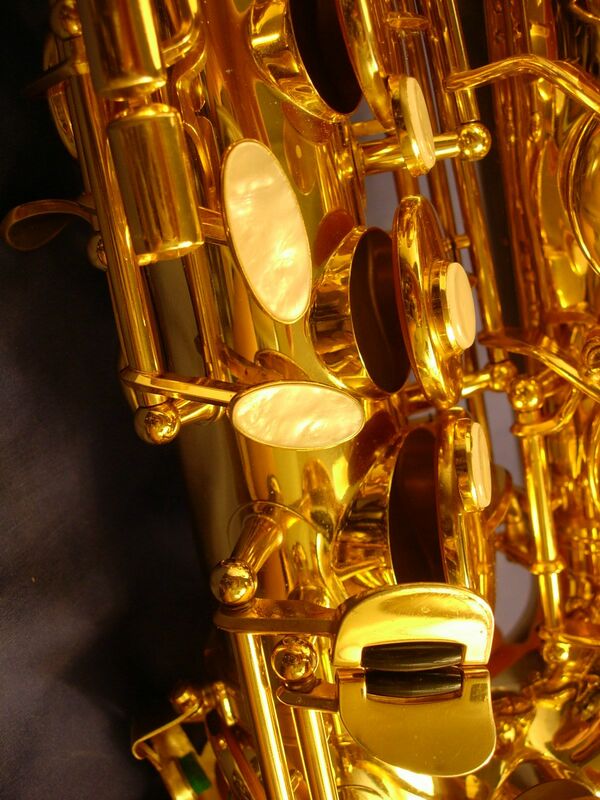 These saxophones represent the Finest German made instruments ever constructed. Their performance rivals all of the best saxophones throughout history! The B&S Medusa saxophones are also among the most affordable professional saxophones on the market. A couple of months later, on April 1, 2004, Dave first mentions the various models, as well as their various finishes, features, and options. I know that the materials from B&S were incorrect because I own one (a 3256), and when I bought it new in 2005, the dealer I bought it from had a brochure that showed it keyed to high F#. At the time the B&S website also showed it keyed to that range as well. To my knowledge B&S never corrected this error in either their printed or online materials. That they could have made such a significant error is rather surprising. 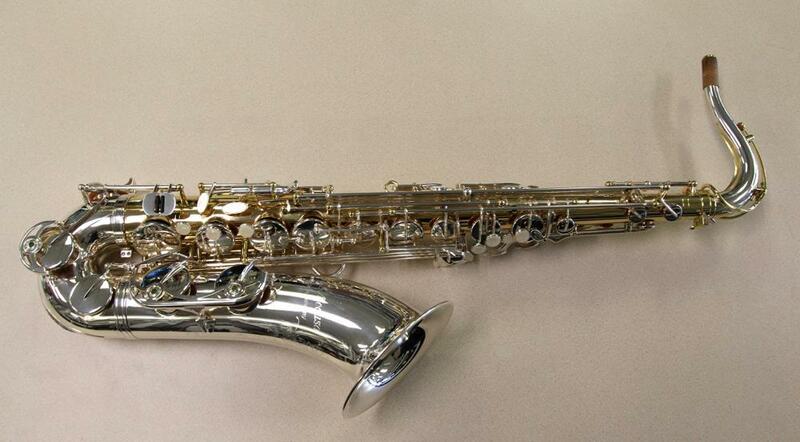 ** This is the only model of Medusa saxophone that did not have ribbed construction. When it came to choices in finishes, B&S arguably gave potential owners of the Series 2006 – Medusa the widest variety we’ve seen since the days of LA Sax. Although there were no exotic animal print saxophones to be had from B&S, the Medusa series was available in a dizzying array of options. Um den Klang der Saxophone weiterhin zu unterstützen und auf möglichst viele Klangwünsche eingehen zu können, wurde die Medusareihe mit weiteren technischen Features, sowie in den verschiedensten Materialien und Materialkombinationen angeboten. Die Kombination aus Goldmessingkorpus, versilbertem Becher, Bügel, Klappen und S-Bogen bietet ein neues Klangspektrum innerhalb der B&S Medusa Line. Zudem werden die Instrumente mit 3 S-Bögen in unterschiedlichen Materialien (Goldmessing, Messing, Neusilber) ausgestattet. 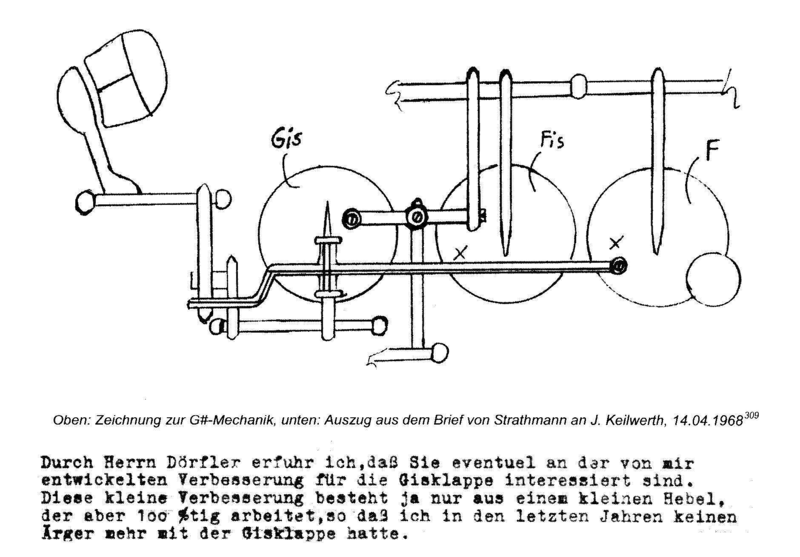 Somit kann jedes Instrument auf die gewünschte Stilistik und Klangkonzeption hin abgestimmt werden. Die Saxophone werden in einer Vielzahl unterschiedlicher Oberflächen und Materialien bis hin zu Sterlingsilber angeboten. In order to further support the tone of the saxophone, and to take into account as many tonal desires as possible, the Medusa Models are offered with a variety of technical features, such as a variety of materials and combination of materials. The combination of Goldbrass body, silver plated bell, bow, keys, and neck offer a new tonal spectrum within the Medusa line. These horns are equipped with necks made of different materials (Goldbrass, brass, and nickle silver). Thus every instrument can be matched to the player’s desired stylistic and tonal concept. 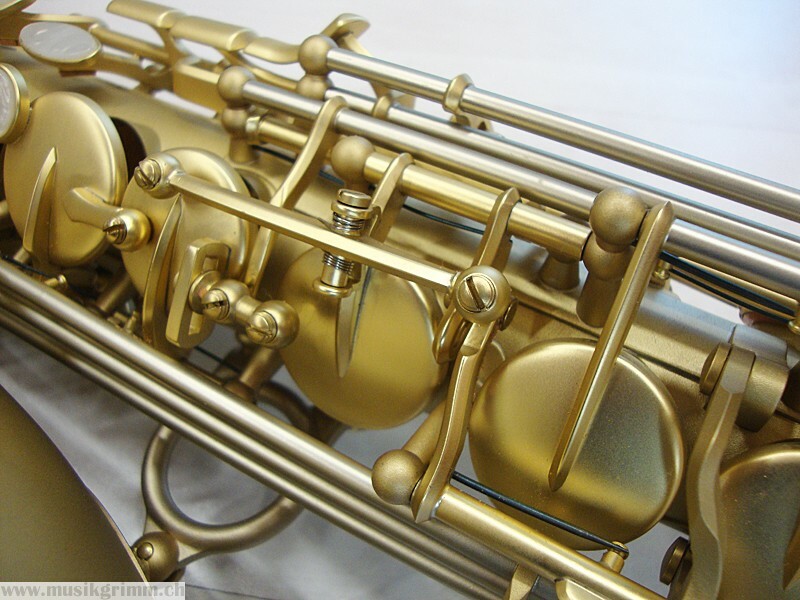 The saxophones are offered in a variety of different finishes and materials, up to and including sterling silver. BTW, the conventional gold lacquer did not appear to have a naming convention. A horn in this finish would just be known by its model number. This is the only example of the extra engraving on the bow, tube, neck, and keys that I have come across. The Goldbrass material is very similar to Bronze. It contains more copper in the metal alloy content. The slightly heavier metal produces a richer tone. Brass – Standard model neck. Yellow brass gives overall a brighter tone. Nickel Silver – This neck produces a rich, edgy tone. Goldbrass – Gives darker tone. 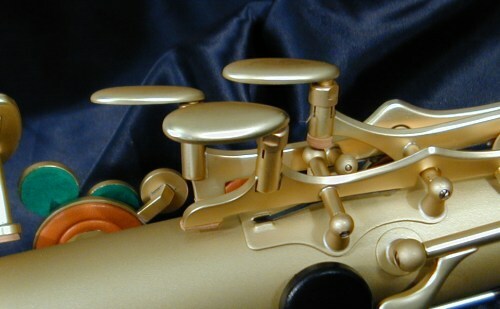 Another variation on the Goldbrass finish that Kessler carried was this alto, which is B&S’s “G/L” finish. 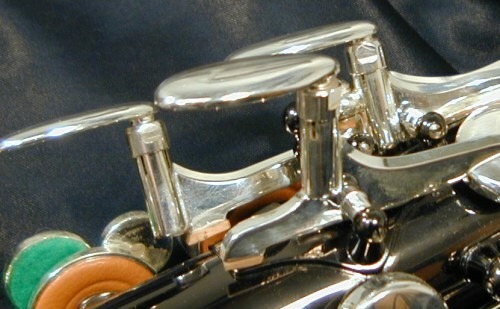 This horn has a lacquer body and silver plated keys. It is alto #016050. If it’s not stamped Goldbrass by the serial number, it’s not Goldbrass. 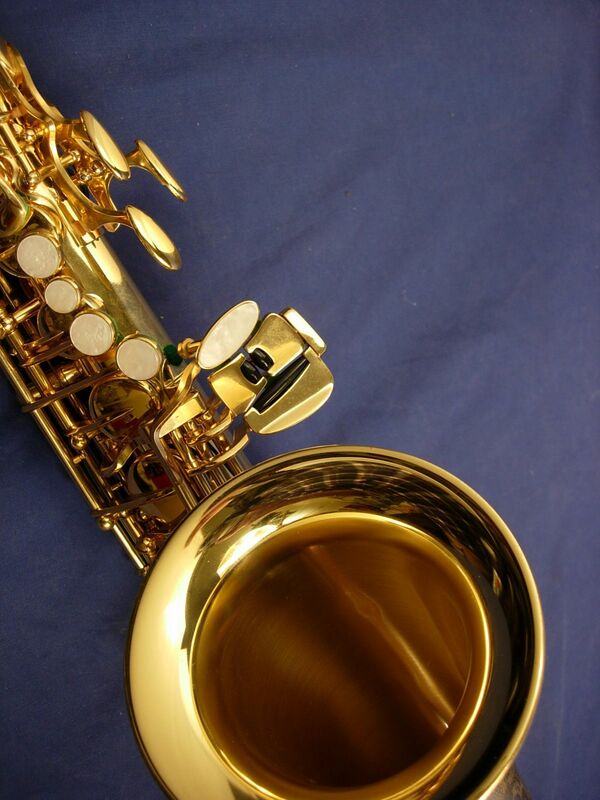 Since the finish that these sub-models of the Series 2006 came in can appear just like their conventional cousins, if you are in doubt about the horn’s material composition, look for the Goldbrass stamping. B&S used a variation of this type of anti-stick G# key on their Codera, later-model Series 2001, and all but baritone saxophone No. 3256 of their Medusa line. 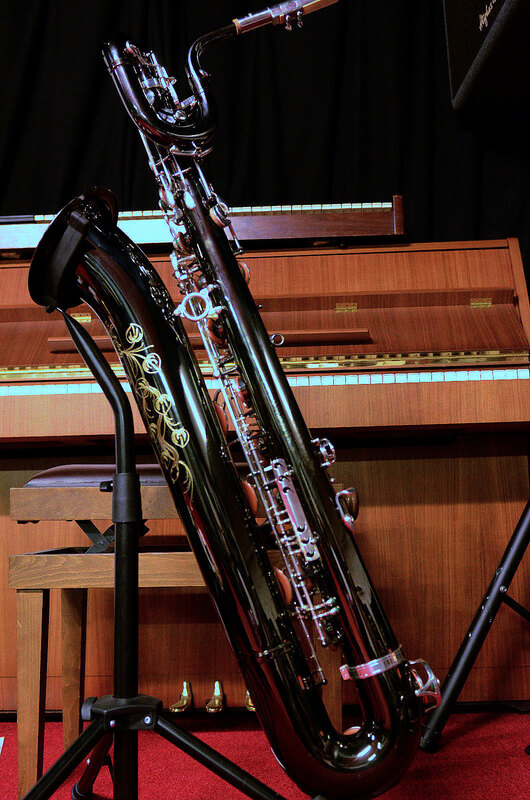 This is a Medusa alto with the sandblast finish (Alto 3239 FSL). It sports the rocking mechanism that was used to prevent the G# from sticking. Notice that like JK, B&S also had their lever end at the F# key, rather than extend to the F. However, their design differed somewhat from JK’s. Not only is the B&S spring obvious from the front, I’m guessing the two companies used totally different types of springs. Did the Series 2006 have an optional high F# key? That’s an interesting question. I guess it depends on where you obtain your information from. Nothing in Dave Kessler’s information—and remember Kessler and Sons Music was an authorized B&S dealer—indicates that horns could be ordered from the factory sans a high F# key. However, on their B&S History page, the German saxophone website Saxwelt writes (quotes?) a description of the Medusa. In addition, all instruments are available with or without a high F# key. Saxwelt had permission for the content on their page from Frank König, Geschäftsführer (CEO) of Ja Musik GmbH—the parent company of B&S. Presumably he would have corrected this rather glaring inaccuracy. That said, I have yet to see a Medusa saxophone, other than Baritone 3256, that did not come with a high F# key. For B&S fans, 2005 was a bad year: it brought about the demise of yet another fine European saxophone manufacturer. In a 2005 interview with the German saxophone website Saxwelt, Frank König, Geschäftsführer (CEO) of Ja Musik GmbH—the parent company of B&S—explained that the production of the professional models Allora, Chicago Jazz, Accent, and B&S Medusa would continue until the end of 2005. After that, only what dealers had on hand would be available for purchase. However, the company would be able to produce semi-professional and professional horns again, once the demand for these horns increased. When asked about rumours that the saxophone production equipment had been sold, König replied that was absolute rubbish. In 2005 that rumour might have been rubbish, but just 5 or 6 years later this did indeed happen, when B&S sold its tooling to the Verne Q. Powell Flutes saxophone division, for the production of its Silver Eagle.3 With the demise of the Silver Eagle in 2014, we are left to ponder: Whatever happened to the tooling? Why did B&S stop saxophone production? In the same 2005 interview with Saxwelt, Frank König lists a few of the factors that led up together the drastic reduction of saxophone production—which ultimately saw the company cease all production of semi-pro and pro horns, and never start manufacturing again. Normal development of new models, which therefore led to previous Series (such as the 2006) being discontinued. The flooding of the market by cheap saxophones. In Markneukirchen it is not possible to manufacturer a saxophone for €300. In Germany it is not even possible to obtain the materials for that amount. Added to that are the labour costs, which are multiple times higher than they are in some Asian countries. Sound familiar? It should. It’s the same swan song that ultimately killed much of Europe’s saxophone production, and is the reason even Selmer Paris is now producing a saxophone made of outsourced parts. People want to buy the cheapest stuff they can find, and in so doing, are literally killing off the companies that have been around for generations. Specially trained craftsmen are finding themselves out of work; their jobs shipped off-shore and automated. Sound familiar? Isn’t this the exactly same song the Americans are singing about their manufacturing industry? Food for thought. Just think about that the next time you want to buy the “cheapest” anything. 1 Any of the materials cited on this page citing Dave Kessler, come either directly from him, or indirectly through the Internet Archives of his old website. Thank you Dave, for being so generous in allowing me to use your intellectual property. 3 From the Company Overview section of the Silver Eagle Sax Facebook page.